Gengo (www.gengo.com) is a Tokyo and US based translation technology company that has pioneered the concept of Translation as a Service (TaaS). They make a network of over 5,000 freelance translators look to software developers like an automated translation service like Google Translate. This innovative category of service enables developers to embed high quality human translation into virtually any application, web service or business process. This has the potential to revolutionize the way translation is integrated into many types of publications, e-commerce platforms and communication services. Read on for a comprehensive review. Gengo was founded in 2008 by Rob Laing and Matt Romaine, British and Japanese-American ex-pats who met while living in Tokyo. The company was founded with the idea of making professional translation economical, highly automated, and easy to integrate into modern web services. The company has since become one of Silicon Valley’s hot startups, having drawn the attention, and money, of well known investors like Dave McClure (500 Startups), Mitch Kapor (inventor of the Lotus spreadsheet) and Atomico (a fund backed by the founders of Skype). Gengo’s core offering is a professional translation web API or web service. This enables software developers to embed human or machine translation (MT is powered by Microsoft Translator behind the scenes) into their applications and services. Gengo also offers a retail translation product, Gengo Express, that enables customers to upload texts or documents to be translated via a web form. Gengo’s web order form, a great way to request one off translations for texts and documents without using the web API. The web API enables customers to request translations to over two dozen languages, and to select from a variety of service tiers to adjust for cost, quality and turnaround time (as of this writing, costs range from 5 to 15 cents per word, making them quite competitive on price). The API is comprehensive, well documented, and includes client libraries for major programming languages including C/C#, Java, PHP, Python and Ruby. Experienced software developers can integrate Gengo into their applications in a matter of just a few days. We’ve seen customers build a variety of interesting applications using Gengo as a service, including: Dakwak (a turnkey web translation service), Postlingo (an email translation service) and Transifex (a translation and localization management tool). Software developers and channel partners: API translation based services like Gengo are a great fit for software developers, and for companies that need to deal with large volumes of translation work and have staff developers to do integration work (for example an online retailer that has tens of thousands of product listings to translate). This type of service is not a turnkey solution, for example if you need to have a web site translated, but don’t want to write custom software. However, these service providers are beginning to partner with companies that offer turnkey solutions for a variety of industries and processes. (XLATN can help you find them too). 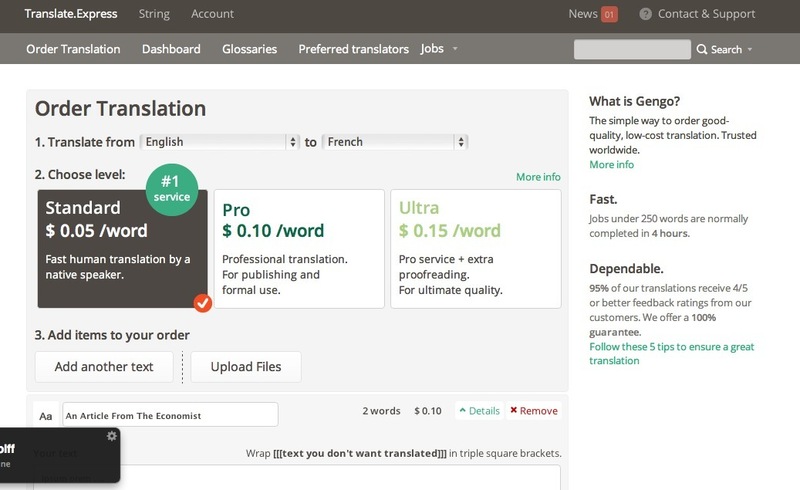 Casual users: Gengo makes it easy to request professional translation via their web order form. If you need a menu or sign translated, for example, you can just cut and paste your text into the web order form, then receive an email notification when your project is done. (Many translation agencies provide web ordering like this, but Gengo’s system is designed for fast turnaround time at a low cost, so its also a good fit for translating one off projects like this). Companies similar to Gengo include New York based SpeakLike, New Zealand based Straker Translations, and Israel based One Hour Translation. While other translation service providers do offer APIs, most do not make theirs publicly accessible, and are not focused on software developers as a market, so they are not listed here. This entry was posted in APIs, document translation, localization, reviews, translation agencies and tagged agency, gengo, lsp. Bookmark the permalink.